I asked my weekly art quilt group for advise on how to achieve a sense of depth on an art quilt that I had in progress. Some of the ideas they came up with were: blur the background, use grayed out shades of the foreground colors, make things smaller and less distinct the further away you go from the foreground, and pop the foreground colors and detail. I also read some articles on achieving depth from oil painters and water color artists, who utilize depth more frequently than art quilters tend to do. Use all of your sources! You can see by the picture, I hope, that I emphasized the bid and nest, and blurred the inside of the nest and the sky behind the bird. To achieve this, I used 2 layers of organza on the sky, and adding tulle to the nest. The nest materials include goat hair, embroidery floss, wool roving, tulle, organza, yarn, old book pages, ribbon, thread and shredded fabric. The baby bird has several colors of fused fabric and is colorized with color pencil and Inktense pencils. The very wispy hair is made with 3 layers of goat hair and embroidery floss. 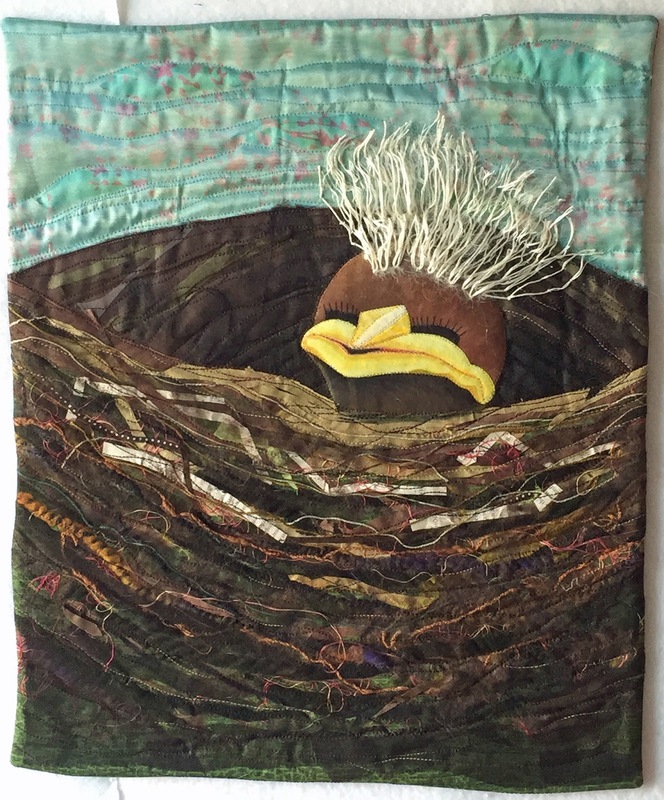 This quilt was based on a photograph that was shared and copied on many blogs, but none of them mentioned the original source. Too bad - I'd love to give credit where credit is due.